My grandmother tells me that the victory of Good over Evil is the reason for this celebration. She also says that the festival is to mark the return of Rama to Ayodhya after his defeat of Ravana. Lots of people also start new ventures on this day after performing Lakshmi Puja. This is marked by lighting of lamps, candles and diyas by the women folk in the family. The light and colour add to the celebrations. 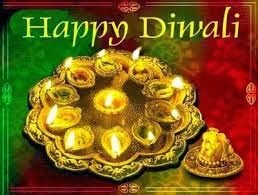 In all, I can say that Deepavali is the brightest festival to be celebrated in India. The delicious food associated with the feast makes us feel that this festival must come more often in a year. The first day is called Dhanteras - On this day people buy new utensils or anything in gold or silver. 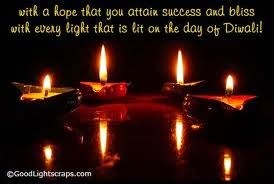 The second day is Choti Deepawali - On this day diyas are kept at any dark corner of the house to symbolize that no evil can enter the house in the lights. The third day is Deepawali - People decorate their homes with diyas,candles and decorative bulbs and lights. Laxmi Ganesh Pooja is performed and then people light up crackers and enjoy themselves.Sweets and rich food is also prepared at home to celebrate the festival. The fourth day is Govardhan pooja on which the Govardhan pooja is performed to celebrate the great deed of Lord Krishna who lifted 'Govardhan Parbat' on a single finger and gave protection to the people from the heavy rains. And the last day is Bhai dooj on which sisters put 'roli teeka' on their brother's forehead and pray for their well being.